I picked up Seveneves purely on the basis of seeing its opening line quoted on a blog: “The moon blew up without warning and for no apparent reason.” I mean…right?? Knowing nothing else about the book and never having read a Stephenson book before, I went into it expecting a disaster movie of a novel, some sort of alien encounter, or something equally odd and action-packed. I was not expecting a sprawling, meticulously researched saga spanning millennia. In fact, it’s a bit of an effort not to just make the entire review a shouty “Do you have any idea how much research and sciencing and math stuff Stephenson had to have done for this?! It’s staggering! !” That was by far the main thought running through my head while reading, especially through the first two acts of the book. Unfortunately, the main problem is that all the scientific accuracy comes at the expense of the story. 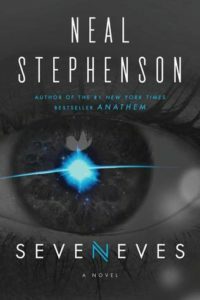 There is so much that Stephenson has dreamed up and designed and built that he wants to cram in, which means things are introduced, explained once, and then put into play with the expectation that the reader will remember all that background and the full technical explanations as well as Stephenson does. This was a trial for someone who does not much engage in hard science (me). This idea of scientific realism also gets in the way of effectively writing the people. It starts off strong, narrowed in on the life and thoughts of one particular scientist balancing research and physics with the human emotions one might expect when the moon explodes. But the angle quickly widens as humanity’s survival instincts kick in and the whole world comes together (sort of) to do something about this impending disaster. Realistically, of course, there would be many people involved politically, technologically, financially, etc., and I appreciated that he avoided the “one genius does everything” trope, but no other character in the ensuing crowd ever resonated like Doc and his family did. Indeed, with so many constantly showing up and dying off in scientifically realistic disasters and mishaps, I started having trouble keeping the characters straight, let alone sympathizing with them. (A grain of salt: high character turnover was a significant factor in me giving up on A Song of Ice and Fire early on, and I know some of you like that series a lot.) I won’t even get into some of the truly weird race theory that crops up in the third act. I hate to score this book poorly, as there was so much about it that I respected immensely about it, but I also suppose respect is pretty different from enjoyment. It’s a pity they couldn’t have gone a little more closely hand-in-hand.